Ireland was no exception to the general rejection of pro-austerity governments in the European elections. Three sets of elections took place on 23 May: Local elections across the country; European elections and two by-elections to the Irish parliament. These were the first nationwide elections since the coming to power of the Fine Gael – Labour coalition in 2011, and since the fake “exit” of Ireland from the Troika’s bailout programme. 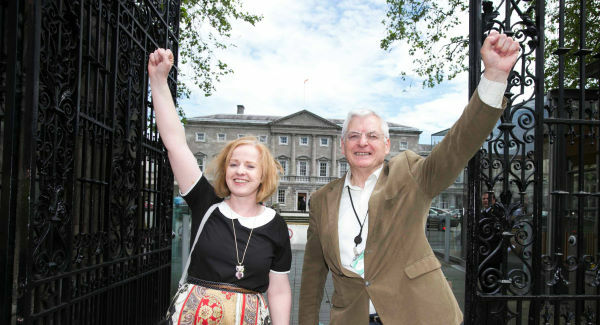 The Socialist Party and Anti Austerity Alliance, which the Socialist Party initiated following the battle against the Household Tax had a very successful election campaign, electing Ruth Coppinger as second Socialist Party TD (member of parliament) for Dublin West, and 14 councillors. Paul Murphy, while unfortunately missing out on a seat, won 30,000 votes in the European elections in the capital. All three elections were characterised fundamentally by a surge against austerity, and a battering of the government parties. Against the backdrop of a deepening cost of living crisis, after 6 years of wage cuts and mass unemployment; a housing crisis and mass emigration, the government’s rhetoric of “economic recovery” seemed like a sick joke to huge swathes of an angry working class and middle class electorate. The electoral results have already precipitated a crisis in the government and the resignation of the Labour Party leader and Tanaiste (Deputy Prime Minister), Eamon Gilmore. While some votes are still being counted, the extent of the defeat suffered by the government is clear. Fine Gael lost over 12% support since the general elections, while Labour suffered a near-wipeout dropping from 19% in the general elections to 7% on 23 May. Fianna Fail (FF), while improving on its disastrous 2011 wipe-out, failed to regain anything close to its previous levels of support, especially among working class voters. The vast majority have not forgiven FF for its role in sinking the economy and bringing in the Troika, and laying the basis for the Property and Water taxes. Low and middle income voters refused to merely back the other leg of the capitalist two-party system to damage the government, only to make way for more of the same. More than just punishing the government, they looked to options which could more clearly express their opposition to austerity in general. This reflects a mass search for a left alternative taking place. The main winners were Sinn Fein (SF) – which saw a huge rise in its support, becoming the biggest party in Dublin -, Independent candidates (especially independents seen to oppose austerity, water taxes etc) and the fighting left, including the Socialist Party (CWI in Ireland) and the Anti Austerity Alliance (AAA). The main losers were the Labour Party, which suffered a momentous battering. They have been left with no MEPs, and been decimated in the local elections, especially in working class areas. In Dublin city council, where Labour was the largest party before these elections, it was relegated into 5th place. The Labour Lord Mayor of Dublin lost his seat on the council. In Cork city, where Labour had also held the mayor’s position, they lost all 7 of their councillors. Despite Eamon Gilmore’s resignation – as he faced two simultaneous “no confidence” motions – no real “change in direction” will be forthcoming from Labour. Joan Burton, front-runner to succeed Gilmore, is the Minister responsible for slashing social welfare spending and child benefits. However, such is the threat of electoral extinction for Labour, it cannot be ruled out that they are forced to pull out of the government in the near future. Huge numbers of working people had voted Labour at the 2011 general elections, based on anti-Troika rhetoric (“It’s Labour’s way or Frankfurt’s way”), opposition to a Water tax, and cuts to social welfare, only to witness their overnight “conversion” into the Troika’s best servants. Decades after the Labour leadership crossed over to the camp of the capitalists, events and experience have seen the majority of workers take note of this reality, reflected in Labour’s collapse in working class areas. Perhaps the clearest expression of this was the Dublin West by-election, won by Ruth Coppinger of the Socialist Party. Press reports spoke of and “impressive victory” by “Red Ruth”. This was an election to replace a former Labour TD (member of parliament), himself elected after topping the poll in a by-election in late 2011 with over 8,000 first preference votes. Last Friday, the Labour candidate polled just over 1,000 votes in the constituency, came in 7th place and was the first party candidate eliminated in the count. 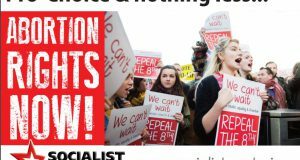 The Socialist Party waged an unrivalled campaign in the bye-election, despite simultaneously fighting to win in 39 local election campaigns and the European elections in Dublin. Our campaign material, posters and manifesto tuned in perfectly with the anger of a working class community betrayed by Labour sellouts. “Labour sold out on the water tax and austerity: don’t just shout at the TV”, “Labour: axe the water tax or watch your vote collapse”, were some of many slogans on SP and AAA posters plastered all over the constituency. Ruth Coppinger was elected following a long counting process, with over 12,000 votes, around 3,000 ahead of Fianna Fail candidate, David McGuiness, with Sinn Fein’s Paul Donnelly in 3rd place. Ruth was subjected to attack from all sides in the last weeks of the campaign, with both Sinn Fein and Fianna Fail going all out for the seat. Both candidates circulated literature to homes in the constituency with dishonest and distorted attacks on Ruth and the Socialist Party. The fact that Ruth and the Socialist Party were able to respond effectively to this, and win the seat comfortably despite a huge national swing towards Sinn Fein (which also greatly increased its vote in Dublin West) is a testament to the strength of the Party, its ideas and record in the area, where Joe Higgins has served as public representative for nearly 25 years. Ruth also topped the poll in areas of the constituency outside of Joe’s traditional base, such as Swords. The Anti Austerity Alliance stood 40 candidates in the local elections in 6 different cities. The Alliance emerged from the battle against the household tax and property tax, which at one stage succeeded in organising non-payment of the household tax by over 1 million people. It was initiated by the Socialist Party and other independent campaigners against the tax, with roughly half the candidates members of the Socialist Party. The campaign was a huge success, and represents a breakthrough for the fighting left, which will be of great value to workers across the country in the next period. The AAA won 14 seats from 11 wards in 5 councils around the country, narrowly missing out on 3 more. Perhaps most significantly, the AAA made a huge breakthrough in Limerick city, electing 3 out of 4 candidates: Cian Prendeville, Paul Keller and John Loftus. This result, along with the breakthrough in Cork City where 3 AAA councillors were elected, makes the AAA the only fighting left organization with an important base and public representatives in Ireland’s 3 main cities. In Dublin, the AAA took 2 council seats in Mulhuddart with Ruth Coppinger and Anette Hughes elected with 25% of first preference votes; Sandra Kavanagh in Castleknock, Eugene Coppinger in Swords, Mick Murphy and Kieran Mahon in Tallaght Central, Brian Leech in Tallaght South, and Michael O Brien on Dublin City council. In Cork, Mick Barry was re-elected in the Cork city North Central ward, along with new councillor Lil O Donnell. Marion O Sullivan was also elected, as the first ever woman councillor in Cork City North West. The AAA will have 3 councillors on Cork City council, and Labour none. In Galway city, 3 AAA candidates also achieved respectable results in their first electoral outing. Ciaran McKenna narrowly lost out on a seat in Drogheda. Paul Murphy, Socialist Party MEP, received just under 30,000 first preference votes in the Dublin European election constituency, finishing 5th, ahead of the Labour Party. This followed a campaign which saw Paul emerge from an initially marginal position in polls, to become a real factor in the race. Considering the circumstances, with a massive swing towards Sinn Fein, now the biggest party in Dublin, and the sectarian decision of the People Before Profit Alliance (dominated by the Socialist Workers Party) to stand against a sitting fighting left MEP with a record of assisting workers in struggle in Ireland and internationally, this result is a considerable achievement. Paul’s TV appearances on debates, especially in the last week of the campaign earned him great respect and admiration throughout the city and country, as a militant and capable defender of the working class and socialist ideas. The People Before Profit alliance – which has also seen some success in local elections in Dublin – in running Brid Smith against Paul and the Socialist Party, split and damaged the left challenge. This altered the dynamic of the campaign from its early stages, as opinion polls showed the left challenge as split and marginal and made the possibility of a left seat seem less credible to the mass of people. Paul Murphy managed to develop important momentum, going from 4% in early polls to a final result of 8.5%, but could have gotten much further if he had started from a better base, which a single left challenge would have. This situation will have led many to support Sinn Fein with their number 1 votes, as seemingly the most viable option to elect an austerity-critical MEP for the city. The combined 1st preference vote of Paul and Brid Smith, who finished in 7th place, was nearly 54,000, which would probably have allowed a single left candidate to be elected. Until now, the justification that Brid Smith has made for the decision to stand was to state that “nobody ever asks Fianna Fáil or Fine Gael why are they both running and splitting their vote”! Many workers and activists outside the Socialist Party have also expressed their anger and dismay at this situation. Honest members and supporters of the People Before Profit Alliance should reflect on this decision and its consequences. A sectarian approach to the left and movement against austerity can damage the chances of success in the battles over the water tax, housing and other issues in the next period. The rise of Sinn Fein has been more limited than some polls predicted: they have won under 16% of the votes in local elections and will elect 2 or 3 MEPs. This still represents a huge rise in their support, based on an anti-austerity, anti-Troika message which the party has developed and refined over the last 4/5 years. SF has skilfully combined anti-austerity rhetoric in the South of Ireland with the implementation of austerity as part of the coalition government in Northern Ireland, and managed to ride the wave of anti-austerity feeling, as the biggest national force opposed in words to austerity measures such as the water and property taxes. It also benefits from anti-establishment credentials built up from the past. In this sense, the rise in its support reflects the radicalisation and a massive opening openness to an anti austerity and left political position in Ireland. However, SF is not a fighting socialist movement which bases itself on the active struggles of workers and the poor to transform society but instead makes a radical nationalist, anti-cuts appeal that does not pose a fundamental break with the rule of big business. 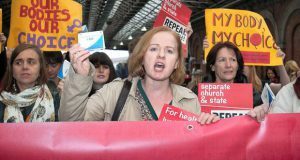 While opposing the Household tax and Water charges in words, they were absent from the campaign of mass non-payment against the Household tax, which was built and led by fighting lefts including the Socialist Party. The perspective of the SF leadership is to enter government following the next general elections, most likely with Fianna Fail. This has the potential to be a “Labour mark 2 moment” that will provoke mass disillusionment among workers who have placed some confidence in SF. Indeed, a few days after their electoral victory, a leading SF spokesman told reporters that the party was opposed to a campaign of non-payment of the water tax, and would not even commit to withdrawing the tax when in government! A consistent left position must start from a refusal to govern with the pro-Troika parties, and a firm commitment to reverse all Troika austerity, to implement alternative socialist policies such as taxation of the super-rich and corporations, and investment based on democratic public ownership of the wealth. The electoral breakthrough for the fighting left in the local elections and Dublin West bye-election must be used to prepare for struggles against the continued austerity offensive of the Troika, whatever government is implementing it. These election results and breakthroughs can also serve to inject hope among working people that austerity can be effectively resisted. The Socialist Party and AAA will now turn its attention to using this success to build for a campaign of resistance to attacks, like the Water Tax. Despite the setback of losing the MEP’s position, the other Irish election results show both the continuing rejection of the austerity parties and the potential for socialist ideas. On this basis, the Socialist Party will confidently continue to fight to build a new mass movement of workers and young people to replace the sell-out parties and transform society along socialist lines.